Sites such as Facebook and Myspace are great places to keep up to date with what is happening. On Facebook if your friends are having an event it is likely you will get invited, this is even more likely if you are friends with bands or friends of bands. 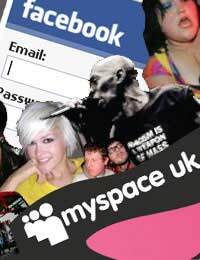 On Myspace it is integral that you are friends with venues, artists and bands from your area so when there is a gig, screening or show in your area you will know about it. Also if you are friends with some of the bigger bands that you like, they might offer priority bookings to their online friends so keep an eye out for any special offers that may crop up. Most cities will have their own website, whether council run or run by a group of dedicated individuals. On these sites there are usually an events section or gig guide where events will be listed in date order, you can check these sites regularly to find out what gigs are coming up in your area. A lot of these sites also include mailing lists which you can sign up to, this is the easiest way to keep up to date as you’ll get dates straight through to your inbox. If you know of a venue that you like and it has events that suit your tastes then you can go to their website and look at their event calendar. These sites also have mailing lists because like any venue they want people to come along to their events, they are also the best sites to get information about the event you are going to see. If you are heading to an event then take a look around, on the walls there should be future events advertised. Also, if your venue knows what it is doing as a business it should have leaflets that you can take away and keep with upcoming events listed on them. Keep these; if you are then stuck for something to do one evening you can refer to it, most big venues have something on every night. You might just find that you end up going to a gig that you never would’ve gone to otherwise! There are various gig guides online which will give you a choice of locations to browse gigs by, you can choose your town or have a look a bit further afield to get a wider range of options. Keep one of these sites in your favourites so you can refer back to it when you are feeling a bit musical or have just been paid! Always a great place to find gigs just type ‘gigs in...’ then your city name to bring up various sites containing the information you need. Many of these will be some of the sites I have listed above but you are always likely to find that rare gem that is only listed in the depths of the Internet.